Firstly the beetroot will need to be cooked. Simmer in water for rough 40 minutes then plunge into cold water and remove the outer skin with your fingers. Dice into small pieces and leave to cool. Make 175ml of strong black coffee and also leave to cool. Preheat the oven to 165°C and grease three 7-inch cake tins with butter and a dusting of flour. Sieve all the dry elements into a mixing bowl, ensuring no lumps, then mix well. For the wet ingredients, add the beetroot and coffee to a blender and blend until smooth. Now add the milk, rapeseed oil and vanilla. Pulse the blender until combined. Transfer the dry ingredients to a stand mixer, add the wet mixture from the blender gradually, increasing the speed of the mixer as more is combined. When all is combined, add eggs and continue to mix at a high speed for a minute or two. Divide the mixture evenly between the cake tins and place in the oven for 40 minutes at 165°C. For the icing, soften the butter to room temperature and add to the stand mixer, also sieve in the icing sugar and cocoa, mixing very slowly at first so there is not a cloud of icing sugar. When combined, add the tbsp’s of water, one by one, so as to loosen the mixture. You may need more or less depending on how you like your icing. It can also be placed in the fridge to firm a little if becomes too runny to frost the cake. When the cake is cooked through, remove from the oven and tins; place on a cooling wire until cooled through. This should take 30 minutes or more. When he cake layers have cooled, place the first layer on the platform you wish to serve the cake and then spread a layer of the chocolate butter icing using a spatular, repeat this with the other two layers. Cover the outside with a generous layer of the icing also, ensuring an even thickness as best you can. 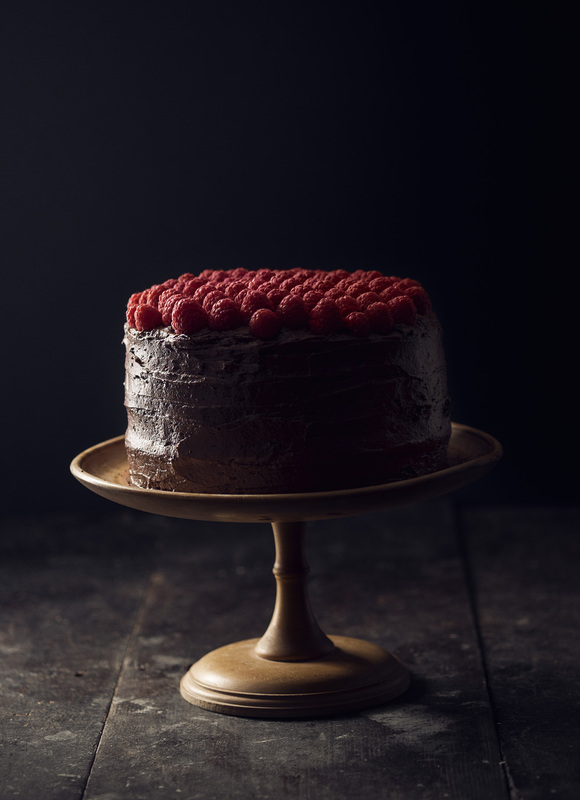 For the topping, carefully place fresh raspberries from the centre outwards until the top is covered. This cake is best served chilled. Beetroot probably isn’t the most beneficial thing that springs to mind when baking. 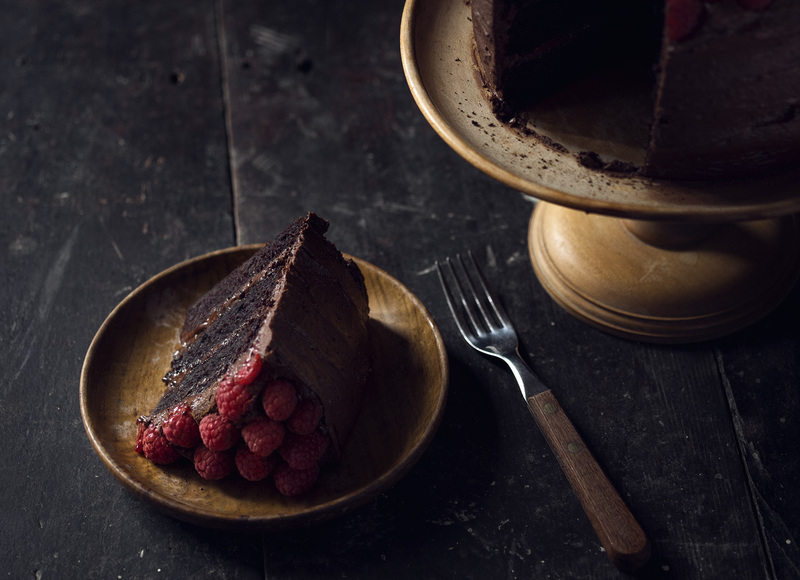 However, it keeps the cake moist and gives it a denseness that when just right, will be like a sponged brownie texture throughout. Just wing it until it is perfect! This was the helpful advice from my friend, Olivia, who gave me the base of this recipe. It is a cake that she kindly makes for everyones birthday, can’t have enough birthdays in the year just for that reason!! The recipe has been tweaked slightly to accommodate a little further experimentation and fine tuning with the addition of beetroot and getting the size and texture just right. I will making this for her birthday. Hopefully it is up to scratch in her eyes.